Columbus’s statement infers that mermaid sightings were rather uncommon, but hardly unprecedented. Folklore of the period abounds with tales of mermaids, and maps of the known world were edged with illustrations of both monsters and mermaids. In fact, mermaid lore goes back at least a far as the ancient Greeks. So what was Columbus actually seeing? It is thought they were manatees. It’s difficult for the modern mind to understand how anyone could mistake a manatee for a human woman – even one with a fish tail. One explanation offered (which seems a tad far-fetched to me) is that it was because the standards of feminine beauty were much different than what they are today. Men preferred a gal with meat on her bones, or at least preferred women this way as a status symbol. There is much debate over whether the men were really preferring women this way in terms of actually being more attracted to overweight women or not. Deprivation of intimacy inflamed all these voyages. Anything in the water became a projection of the sailors’ need for contact. Some people from coastal areas used to claim mermaids as ancestors, so I’m going to interject here with a heart-felt EW, and leave it at that. 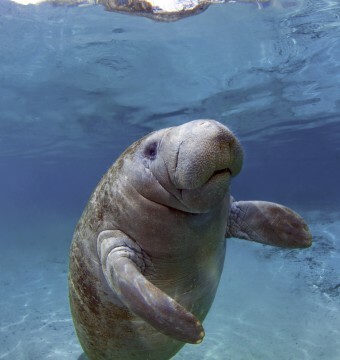 Besides, if you’ve seen a manatee, this theory really beggars belief. I’d say Christopher Columbus was being extremely diplomatic in his assessment, and perhaps sensationalizing things a bit to help in the funding arena for future expeditions to “India”. Or, of course, for Columbus and others of the time to believe they had seen a mermaid, it could be explained by their expectations of the possibility of doing so, and the conditions under which they would have observed the “mermaid.” Many times the mermaid would be spotted from many yards away in poor conditions. When it emerged from the water, its head and silhouette often appeared similar to that of a human, if viewed from far away enough. Lastly, there’s always the possibility that he was hitting the liquor a little too hard, with beer goggles firmly in place!